Point Pleasant City Council members recently recognized Councilwoman Elizabeth Jones, who has served on city council for five years. Jones recently was elected as Mason County Circuit Clerk but will serve on council until being sworn into county office. Pictured, from left to right, are Councilwomen Jerrie Howard, Elaine Hunt, City Clerk Amber Tatterson, Jones, Mayor Brian Billings, Councilwomen Janet Hartley, Leigh Ann Shepard, Olivia Warner, and Councilman Gabe Roush. POINT PLEASANT — Point Pleasant City Council recently met, hearing a request for a new initiative for the city to honor members of the military. Council and city officials also recognized one of its councilwomen who will soon be stepping down to serve in a county office. Council also heard from resident Deana Spaulding has formed a group of individuals who wish to purchase banners of men and women who have served in the military to be hung where the city’s flags fly. Spaulding is working with the American Legion on this initiative as well. This is to honor the hometown heroes of Point Pleasant. Mayor Brian Billings commented this specific initiative is just for Point Pleasant residents who have served in the military. She asked if the city could assist with the hanging of the banners, which the council approved. City Clerk Amber Tatterson commented Spaulding has formed a committee to develop an application for those wishing to have a banner. Councilwoman Elizabeth Jones who represents the First Ward, was recognized for her five years of service on city council. Jones will be stepping down following her election as Mason County Circuit Clerk but will serve on council until sworn into that office. The search is underway to find Jones’ replacement on council with that person required to live in the First Ward. In other business, Tatterson discussed upcoming events with the council members. Krodel Park’s Christmas Fantasy Light Show will be turned on this evening (Wednesday), so those visiting for Thanksgiving will be able to see the lights. The annual Christmas parade and tree lighting ceremony will be held on Friday, Nov. 30. The parade will begin at 6 p.m. and the tree lighting will follow directly after at Gunn Park. The city employee Christmas dinner will be held on Monday, Dec. 17. City offices will be closed from 11 a.m.- 1 p.m. on this day. A proclamation was approved by council recognizing this week, Nov. 18-Nov.24, as Christian Heritage Week. Council approved to change the time of monthly council meetings from 7 p.m. to 6:30 p.m. The day of the meetings will still be the same, the first Monday of each month after the first Tuesday said Billings. Council discussed plans for the city’s July 4th event, which will be a one-day celebration on Thursday, July 4, 2019. They are currently seeking vendors who would want to be set up during the event. Councilman Gabe Roush gave an update on the initiative to have kayak rentals at Krodel Park this spring as well as announced the date of the third annual Bikes & BBQ event to be June 8, 2019, which was approved by council. Attending the meeting were Billings, Tatterson and council members Jerrie Howard, Elaine Hunt, Jones, Hartley, Leigh Ann Shepard, Olivia Warner, and Roush. https://www.mydailyregister.com/wp-content/uploads/sites/24/2018/11/web1_IMG_5494.jpgPoint Pleasant City Council members recently recognized Councilwoman Elizabeth Jones, who has served on city council for five years. Jones recently was elected as Mason County Circuit Clerk but will serve on council until being sworn into county office. 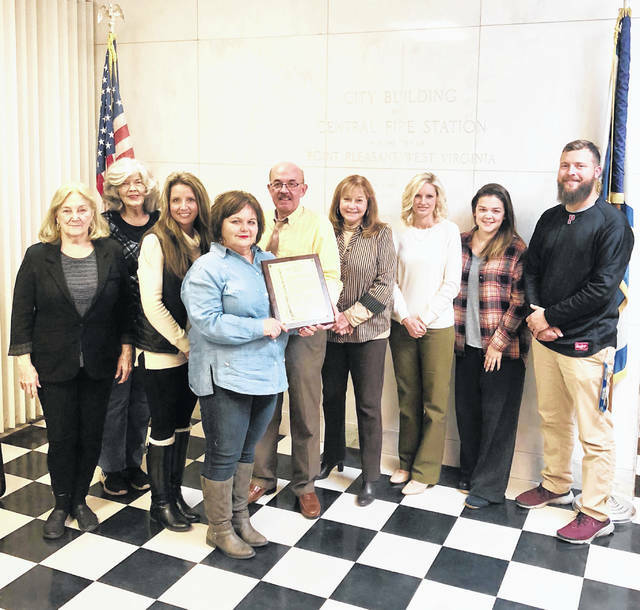 Pictured, from left to right, are Councilwomen Jerrie Howard, Elaine Hunt, City Clerk Amber Tatterson, Jones, Mayor Brian Billings, Councilwomen Janet Hartley, Leigh Ann Shepard, Olivia Warner, and Councilman Gabe Roush.